I'm away again for a month or so. There are some scheduled posts with new creations coming your way, but I'm also taking the chance to do some catching up here at Words and Pictures. Projects which made their first appearances elsewhere for Design Team duties or Guest Designer opportunities, but which only had a sneak peek here, are being gathered together in the pages of my virtual scrapbook. I'm calling them "Encore" posts and they're formatted differently (all the way down the centre), so you can spot them easily. There's something brand new on the way very soon, I promise, but before that arrives we're heading further back in time again - this time back to October 2013 for another Artistic Stamper creation which has been patiently waiting to be added to my online scrapbook here at Words and Pictures. It looks like we may finally have reached the end of the autumn crafting so, for a final fling, here's what I wrote all those years ago. 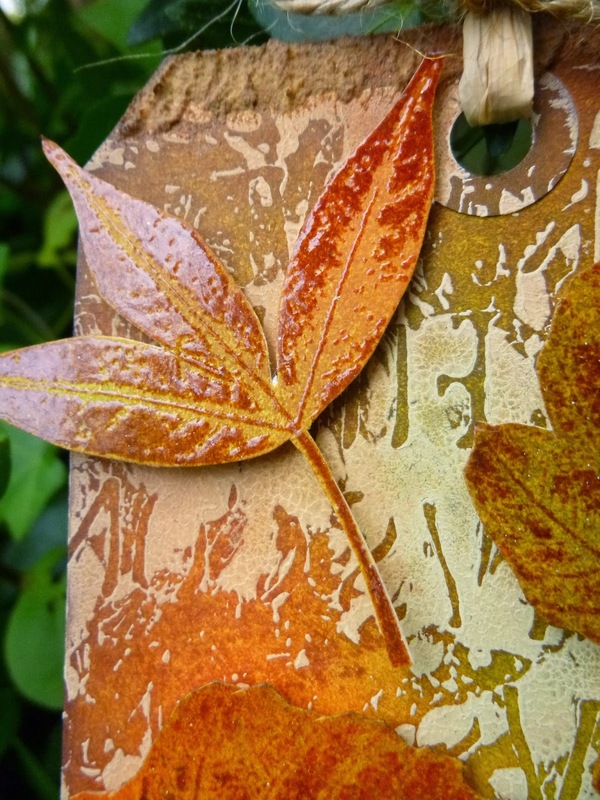 Hello everyone, Alison (butterfly) here, and like many of the team I've been having a wonderful time with Katy Fox's [now Katy Leitch] fabulous new leaf stamps. 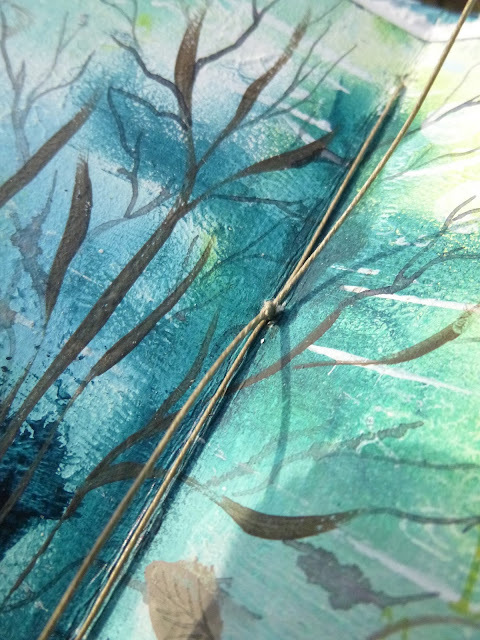 I've been having lots of fun with gesso, inks, clear embossing and fussy-cutting (well... not so much fun with fussy-cutting - I'd be lying if I said it was my favourite thing to do!). The background was a by-product of me doing some stencilling with the Roman Letters onto another tag with gesso. I had this tag nearby and flipped the stencil straight over onto it to get a reverse print of the Letters here. The gesso partly acts as a resist, but - being gesso - also takes some of the colour when you ink over it, as I then did. 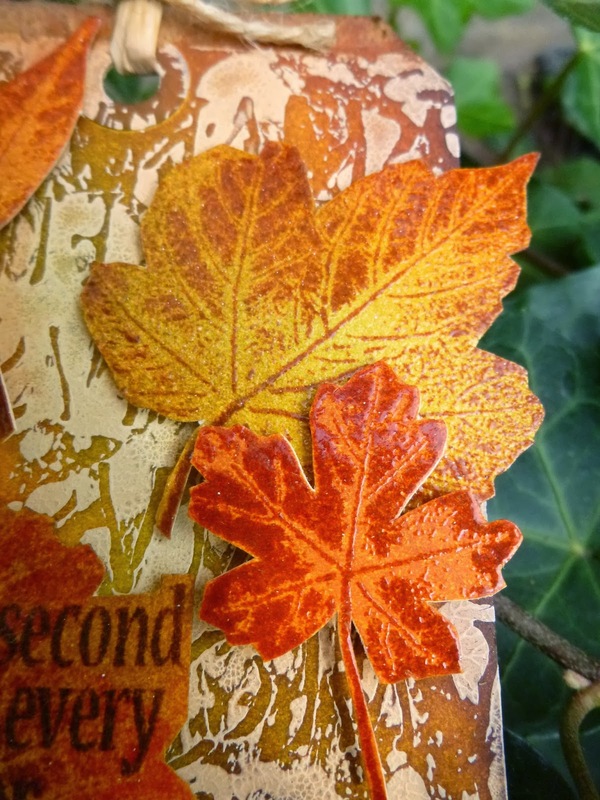 I blended the same colours onto a piece of Manila cardstock, and then stamped the leaves in various combinations of Archival Ink - Sienna, Olive, Fern Green and Sepia - using two or three ink colours on each stamp. I clear embossed the stampings as I went, using the Wow Superfine powder. And then the cutting... The embossing gives you a bit more sturdiness on the very fine areas, like the stalks, so it's quite helpful when you're cutting. I seem to have added some Grunge Paste to create some "earth" at the foot of the tag, patting it on with the palette knife for extra texture, and inking it along with the rest of the tag. One leaf had the privilege of being home to the Camus quote which is also on the stamp plate - it's a lovely font, I think. It's stamped in Potting Soil Archival ink. I arranged the leaves around the tag, and then mounted them using padded tape, sometimes a couple of layers of it, to get different heights above the background. 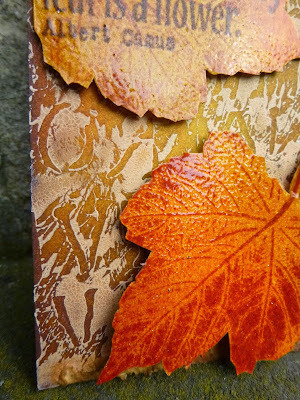 I like the glossy leaves against the chalky background of the gesso. A very simple, natural tag topping of some raffia tied with twine, and my autumnal tag is done. We're almost, almost into December. I can hardly believe it. 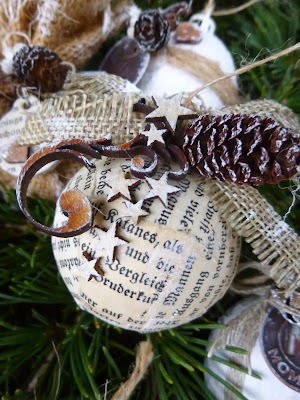 Time to bring on the pine trees, the holly, the snow and the ice as autumn crafting gives way to the winter. Thanks for popping in to check out my Encore posts throughout November (as well as the newer creations too, of course). I'm aiming to play along with the Funkie Junkie 12 Tags of Christmas in December, so it's going to be another mad dash of festive crafting, just like last year... but lots of new things to enjoy, I hope. For now, I'll love you and leave you, and I'll see you in December! The last dead leaves of fall crackled underfoot, winter-crisp. Here's another creation from a couple of years back... September 2015 to be exact. This was one of my Destination Inspiration posts for A Vintage Journey, where you have set ingredients to play with - and I must say, it's one of my favourites. Since it's only three inches cubed, you could consider it some extra inspiration for Anne's fantastic Mini Marvels challenge over at A Vintage Journey right now, November 2017! I hope you enjoy a little trip down a slightly shadowy memory lane into the "regions beyond". Here's what I wrote back then... It's a long one this, so you may want to fortify yourselves with a hot drink, ready for the macabre stories and ideas twisted into this tiny room. 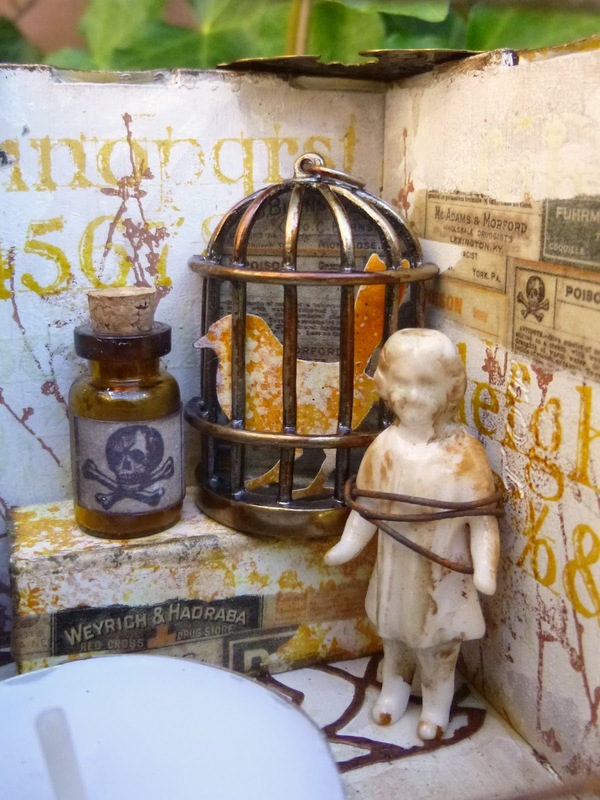 And here's what I put together whilst waiting for departure... a tiny room, which became gradually slightly creepier as the project progressed (well, Halloween is on the way, though it's not quite here yet). It didn't start out that way! 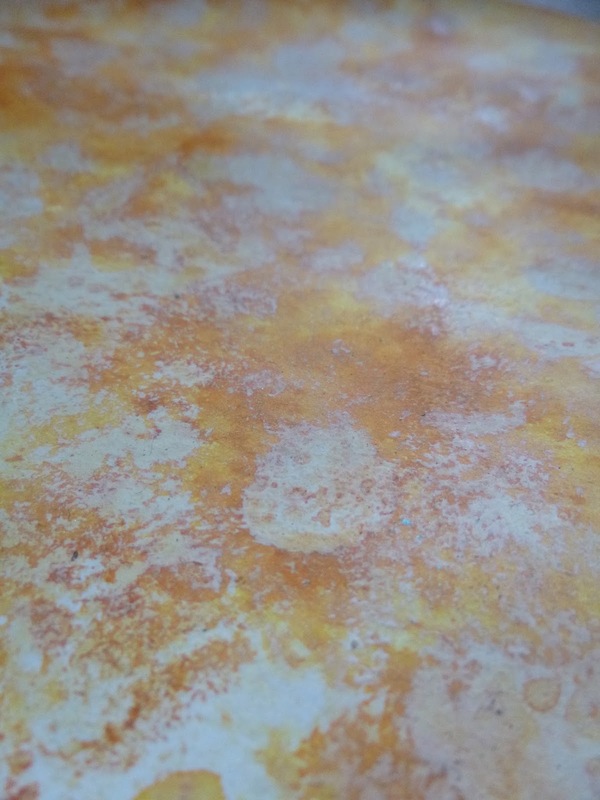 Wild Honey is a colour full of sunshine and warmth. In fact, I did my wrinkle free distressing over some stippled gesso so that I would get some extra texture, and that gave it an even lighter, brighter look. This is pure Wild Honey apart from the gesso - no other colours involved at this point. I'd decided I would use one of the Calico Craft Parts ATB kits. This one is a three inch cube, and comes with a square frame cut out of one side of the cube and with my dollshouse connections it immediately looked like a room to me - once it was put together obviously! I covered the exterior walls with my Wild Honey patterned paper and added some extra detailing with the gorgeous alphabet stamp from the Typography set. It's stamped in Dandelion Archival - a really good match for the Wild Honey but with permanence to it. 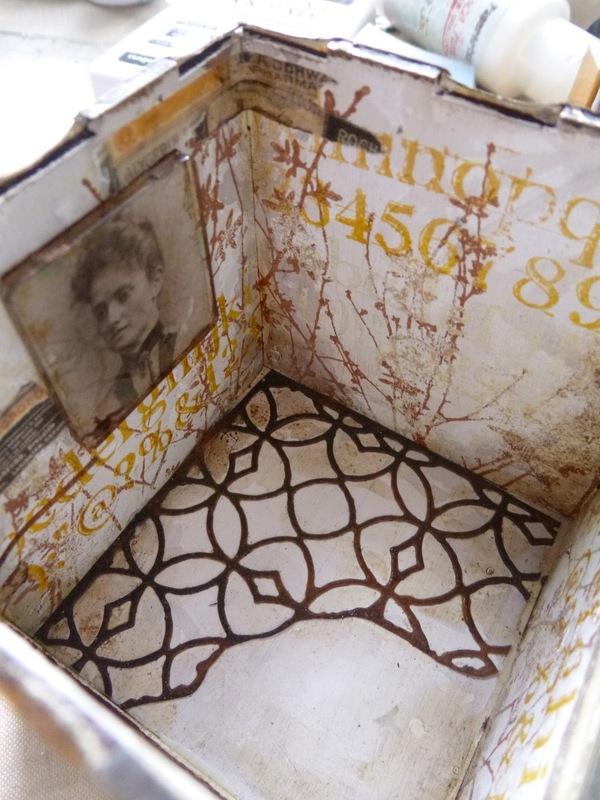 The interior shelf is created out of one of those padding foam pieces that comes in the packaging with embossing folders, covered with some more of the Wild Honey paper and some more tissue tape. By now, the floor was looking a little white and pristine, so I cut the Mixed Media Thinlits lattice out of some brown card and added Vintage Photo Distress Embossing Powder to give it some rusty distressing. I love the look of this, and how the floor is clearly worn away in places. Along with the rusty floor, I also dirtied up (down?) the walls with washes of paint, especially in the corners where nobody has cleaned for years. This also means the resist stamping shows up a bit better too. ... and let you explore from every angle! Subtly macabre - but I tend to think that's the best sort of eerieness... when it creeps up on you with you hardly noticing, but then you suddenly notice all is not quite what it seems. We're past Halloween now, but we are entering the longer nights of winter, and the time for ghost stories round the fire... or at least round the candle! Thanks for stopping by and I hope you all have a wonderful weekend. Hello all - not quite an Encore post today, but a look back in time taking place elsewhere! 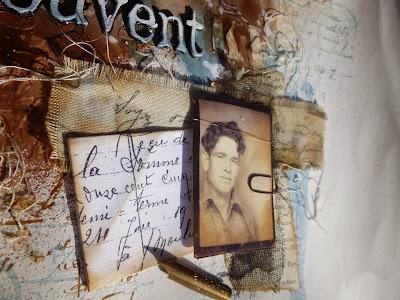 The fabulous Marjie Kemper invited me to be part of her blog series of friends selecting a favourite project to revisit, so I'm delighted to be featured over at her blog today, along with one of my closest blogging friends - whom most of you will know. I was honoured to be asked, and then realised it was actually an almost impossible task she'd set... choose my favourite project?! My Baker's Dozen of favourite projects each year gets more and more generous, and that's only a year's worth each time. How to pick a favourite from more than five years of posts? Generally my favourite is whatever I've just made, the latest step in the journey. Obviously there are projects which represent a leap in learning, or a moment of "oh, yes, that's me there", but there have been quite a few of those along the way, so it's still no good for trying to pick just one. I get an idea, just a spark, and then I have to work out how on earth to make that idea into a reality, and while I wrangle with that central idea, all sorts of other things just fall into place without me really noticing. And it is also a project where I really like the end result too! 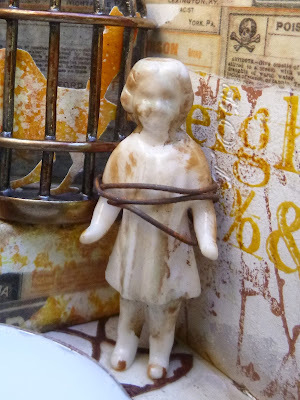 I hope you'll hop over to Marjie's to take a look at what I ended up sharing. It's none of the ones pictured here, though they were all high on the list. Thanks for stopping by today. I know I've been pretty quiet lately. I've been busy creating in new directions, so I've been trying not to get too distracted by online influences. But I'll be home soon with more time to come visiting again. In the meantime, happy crafting all! After that bit of fairly ancient history in Take a leaf out of my book, I've a slightly more recent Encore for you today. 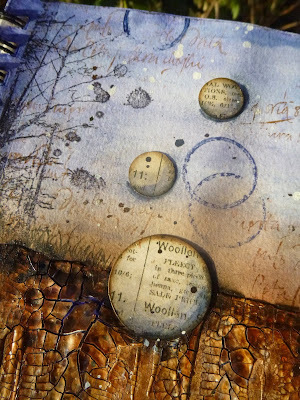 This one appeared over at the Calico Craft Parts blog on October 23rd, 2015. At the time, I was in the throes of an obsession with Wilted Violet, the then new-on-the-block Distress colour. As an addition to my favourite blues and browns, it was making soul sing. 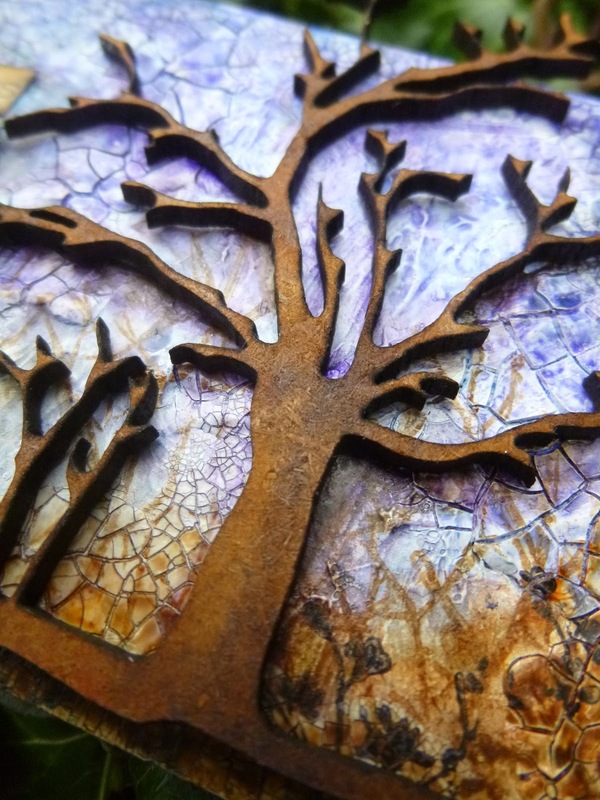 For this ATC I found some DecoArt paint colours to give me that same feeling with the perfect late autumn sky for this fabulous laser-cut tree. I'm playing mainly with watercolours just now (November 2017) and funnily enough there's a similar colour love affair going on. More of that another time... Oh, and since it's an ATC, consider it a little more inspiration for Anne's wonderful Mini Marvels challenge over at A Vintage Journey. Here's what I wrote back in 2015. 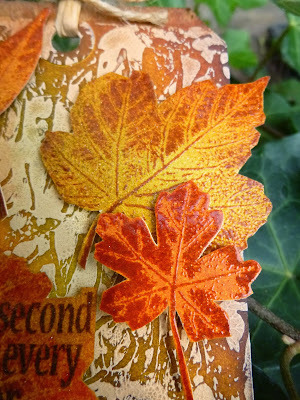 Hello all, Alison here from Words and Pictures with a crackly ATC for you today. It's no secret that I love trees at all times of the year. I love the young spring leaves so fresh and vivid, the luscious summer growth at its height, the glorious array of colour as the leaves turn in autumn (there have been plenty of creations celebrating that lately), but I also love the bare branches, stark against the winter skies. This ATC celebrates that particular beauty. I love working with these ATC blanks. They are sturdy and beautifully dimensional in themselves, and so lend a much more substance to a small piece like an ATC. I've used the Plain ATC but there are lots of designs to choose from. I started by applying a coat of DecoArt Media Crackle Paste in varying thicknesses across the ATC. Once that had dried, I wanted a bit more crackle around the edges so I added some Media Crackle Glaze (which also has a glossier finish) and waited for that to crackle too. Regulars at Words and Pictures will know I've been having a bit of a purple phase... adding Wilted Violet to my autumn colours with great joy. 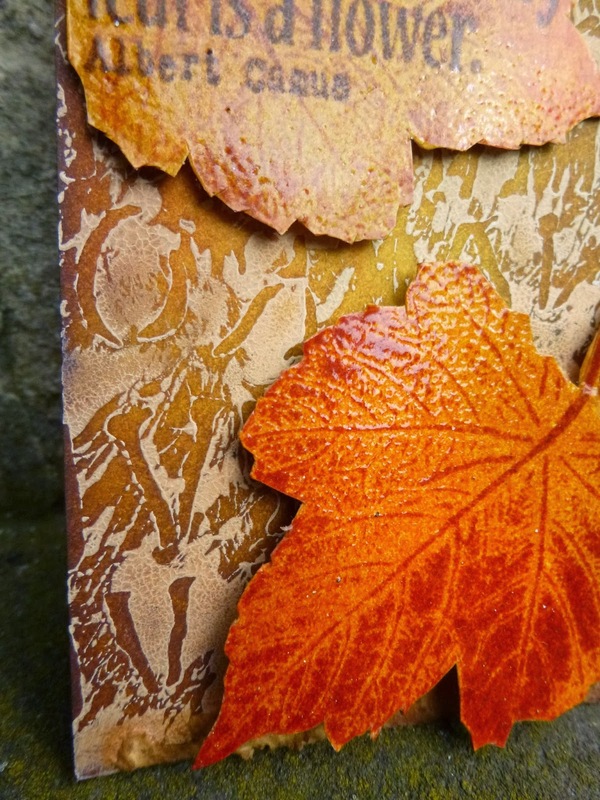 I've played with a similar autumnal range of colours here, but using DecoArt Media Fluid Acrylics, applying them in washes to build the layers of colour. The paints involved are Dioxazine Purple, Cobalt Blue Hue and Phthalo Blue coming down from the top, and Raw Umber, Burnt Sienna, English Red Oxide and Quinacridone Gold coming up from the bottom. 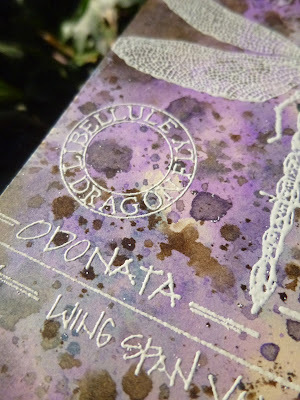 The gorgeous Skeleton Tree Style 3 has also had a touch of colour - a wash of Quin Gold and then some Dioxazine Purple to add the darker shadows. I wanted some scraggy meadow grasses, so I stamped them in Sepia and Black Archival inks around the foot of the tree. And up in the sky the affirmation of the eternal beauty of trees - some ChitChat stickers with the same paints creating shadows around them to bed them in to the wintry sky. I love the dimension of the Craft Parts - they give this little ATC a real presence - and the delicate cutting is so intricate and detailed. I hope you like my Winter Branches - as you can probably tell, I'm rather fond of this one myself! If you're tempted to go shopping, you can click on the links in the text to go straight to the Craft Parts I've used. Do go browsing while you're there - there are always new treats on offer. Thanks so much for stopping by, and I'll see you again soon. So I suppose this one is definitely heading for the end of autumn and into more of a wintry vibe. I'm still not quite ready for the full winter look yet, but we'll get there soon. Thanks for sticking with me while I'm missing in action - but at least there's a little bit of action here on the blog. Hope you're all thriving and happy crafting all! As soon as one leaves, one sees: wet bare branches, fog which floats over fields, trees, homes. Sky. Early dusk. And it all tells an incredibly simple truth.